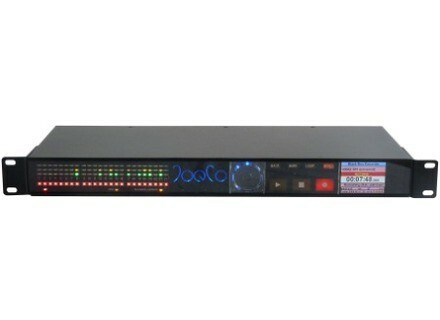 Blackbox Recorder, Digital Multitrack Recorder/DtD from JoeCo. Version 2.2 contains a number of features including announced enhancements to the underlying operating system alongside new methods of displaying information to the user. Interface changes include clarifying clock sources to flashing the transport controls while an operation is pending. The Pre Fade Listen system, introduced in the BBR64-MADI development, now allows to sweep through the channels with a return to "mix" output. According to JoeCo, it's also faster to enter record and to finalize the Broadcast WAV files thus created; timecode reading is quicker and more accurate; master/slave performance has been enhanced and further support has been added for particular drive types. Additionally, the software now runs background checks on the drive to create a more accurate map of free space to further speed entering record, the company says. The Player software add-on now also supports v0 BWF files, which some older DAWs still produce. These and more changes are encapsulated in an upgraded field update manager. You can visit JoeCo at the 131st AES Convention, New York, 21-23 October 2011, Booth 854. Thermionic Culture Vulture Solo The Culture Vulture Solo is a new development of the Vulture recently designed with more of a focus on use with guitar and bass di / amplifier front end applications. Earthworks WL40V Earthworks Microphones will debut its first wireless product, the WL40V Wireless Vocal Microphone Capsule, at AES this year. Porter and Davies BC Gigster Porter & Davies announced the launch of the new ‘BC Gigster’similar to the BC2.